When her world is shaken, will her foundation survive? Idealistic and sheltered with a passion to change the world, Kaylan Richards leaves her comfortable life in Alabama to serve in poverty-stricken Haiti. Despite her inexperience and the opposition of a voodoo priest, Kaylan develops a love for the country and the Haitian people. But something deadly is about to strike. It is the worst earthquake the country has ever seen, and in its aftermath bodies, buildings, and broken lives litter the streets. People she cares about are dead, and Kaylan is caught in the middle of the destruction, questioning a God who said He was good. Navy SEAL Nick Carmichael never planned to find a girl he loved more than his country. Now she is a world away, trapped in a deadly situation nothing could have prepared her for. Can Nick’s love help Kaylan heal and show her the God who never abandoned her, or will tragedy shake even the most rooted faith? Another new author I stumbled across while browsing the fiction section. Lynch has given her readers a solid and emotional read, filled with characters you give your hearts to. The book focuses on Kaylan and her journey to Haiti with her childhood best friend to work for six months. 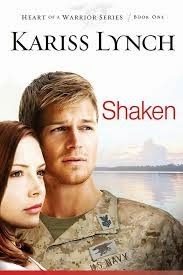 Her plans are disrupted with the arrival of her ex-boyfriend, Navy Seal Nick Carmichael. Nick wants another chance. She wants to give him one but she won't sacrifice Haiti for him. So they write letters. When the earthquake hits, Kaylan's life is in ruins. The only person who understands the pain she is going through is Nick. Can he help her back to a safe place emotionally and spiritually? I liked Nick, he is a solid character, one who is seen to have made mistakes but wants to change and he's determined to prove he can be trusted again. Lynch does a good job in my opinion of showing PTSD for soldiers. Though I'm sure it can be much for than depicted here. But his experiences help Kaylan when she finally opens up to him and her family. Kaylan is a little confusing as a character. The only thing I was sure of about her was that she wanted to use her dieticians degree to teach people in developing nations about good food choices and how to do that cheaply. When she is in Haiti she has much to learn about cultural differences between the western world and the third world and that it's really not that easy to give them some tips on healthy food and job is done. Thankfully she learns a little more by the end of the book. For the most part though, Kaylan spent more time thinking than doing and her interactions with the Haiti people came across as cliched to me. So she was a little hard for me to like because I felt I didn't get to really know her. The Haiti earthquake was well done. I don't remember the details of when and the damage etc, but I recall the fall out when on for years. How to rebuild in such a place is heartbreaking. The pain of the people is brought into the story. The repercussions of this earthquake are far reaching and Kaylan, her family and friends refuse to sit by and doing nothing at the story concludes. They have been touched by this tragedy and felt the need to give back - to help with the healing in any way they could. A lot of questions are flung at God by Kaylan, who understandably asks "Why, God, why?" a lot. I felt her faith was quite shallow at the start of the story though and I didn't see it really grow until right near the end when she finally just tells God how she feels. This act of sharing starts to heal and unburden her. Overall I enjoyed this book. It made me cry in several places and I was immersed in the story. A recommended read to get a glimpse into a great tragedy and to see that God's love does indeed shine in the darkness.